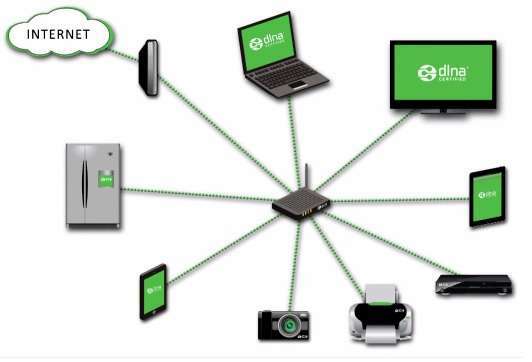 This page describes what is DLNA technology. It mentions how to set up DLNA network. DLNA is the short form of Digital Living Network Alliance. It allows sharing of data over a home entertainment network. The data which can be shared using DLNA certified devices include music, video and pictures. The standard has been founded by group of electronics companies manufacturing consumer products. DLNA alliance has more than 250 companies. The goal is to eatablish ecosystem of compatible products for networked media devices. There are many DLNA certified products from various vendors. • Play MP3 music on smrtphone using HiFi system. • Print photo from tablet to network printer. The DLNA feature can not be supported on old existing products. The technical products come along with DLNA feature built-in, Please check for DLNA certified logo on the product itself. Following table lists out DLNA approved formats for video, audio and images. There are two types of DLNA products viz. servers (e.g. PCs or router or modem) and DLNA clients (e.g. smartphone, laptop, TV, tablet, Blu-ray player, printer, camera, refrigerator, digital radio, soundbars etc. ) Let us understand how to setup DLNA network. ➨Modem is connected to internet using phone line, DSL line, satellite or cellular network. ➨Once the modem is wired with internet chose network name, turn security on and set the password. ➨Now you need wireless router to establish network using all the home entertainment devices and appliances. ➨Connect router with modem and all other client devices are connected with modem either using ethernet cable or using wifi. ➨Now DLNA certified products can communicate with one another to share the data.